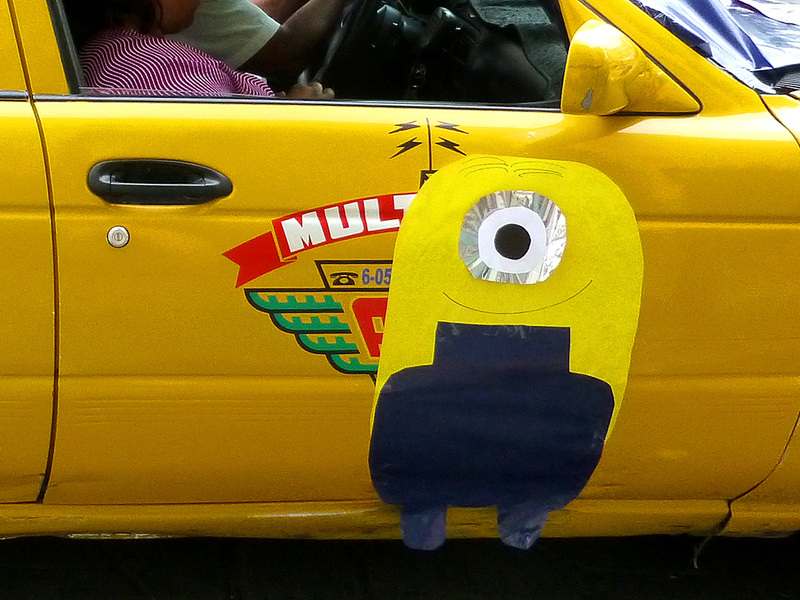 Apparently, when the Minions went in search of their next evil boss, they must have stopped off in Oaxaca. 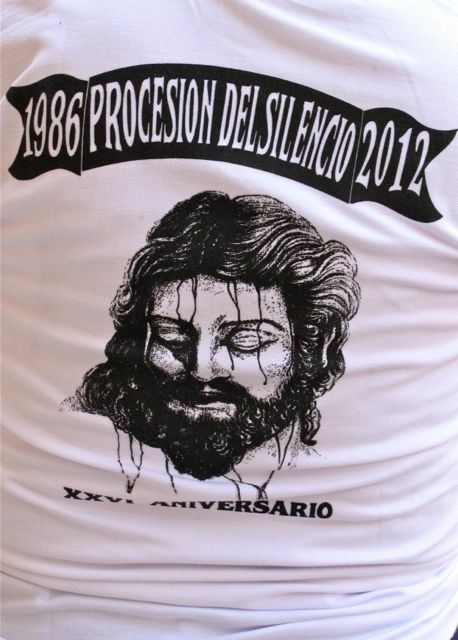 My first sighting was on the bus back to the city from the Guelaguetza in Etla two weeks ago. 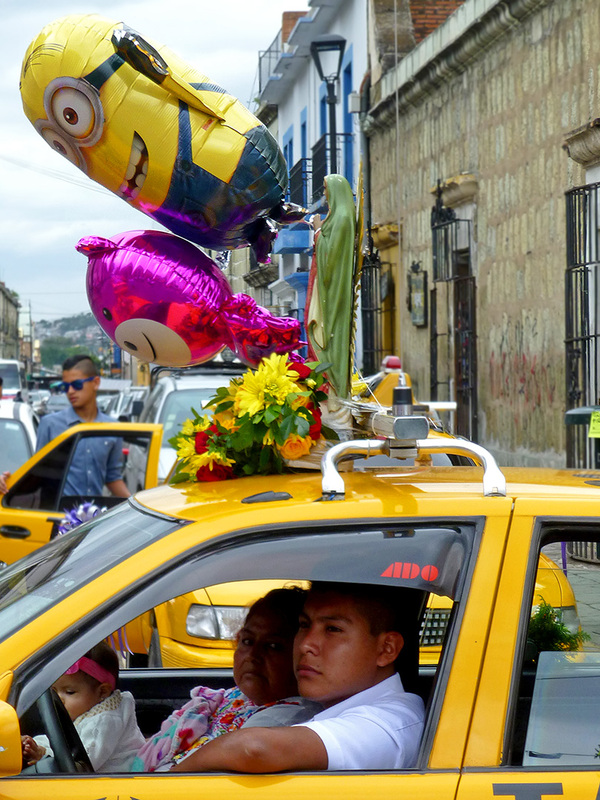 Then, there they were today, as taxis paraded through the streets of Oaxaca, celebrating Día del Taxista. 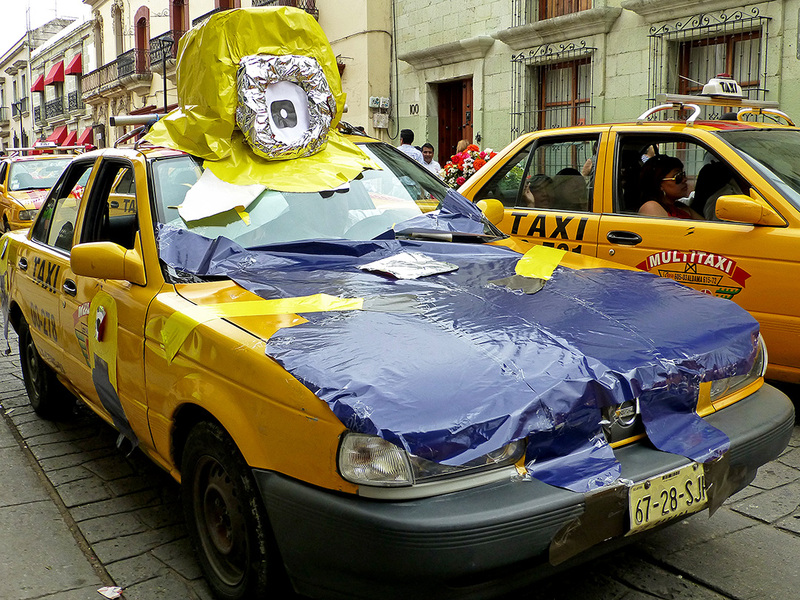 Hmmm… Is there something about the movie that resonates with the transportation workers of Oaxaca? 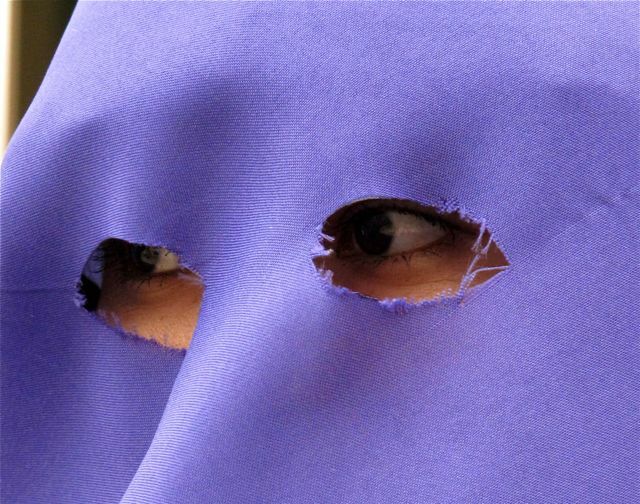 Scarlett Overkill (the Supervillainess): DO you know who this is? 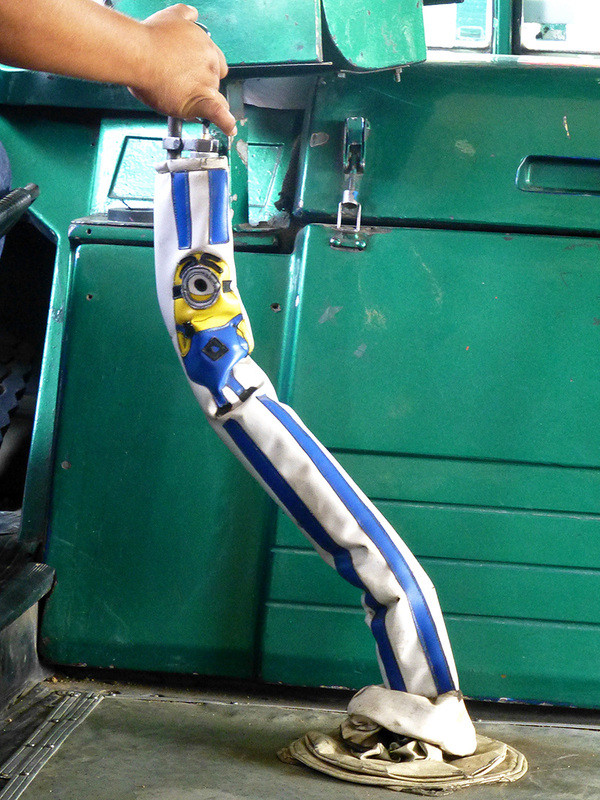 Kevin (the Minion): Uh… la cucaracha? 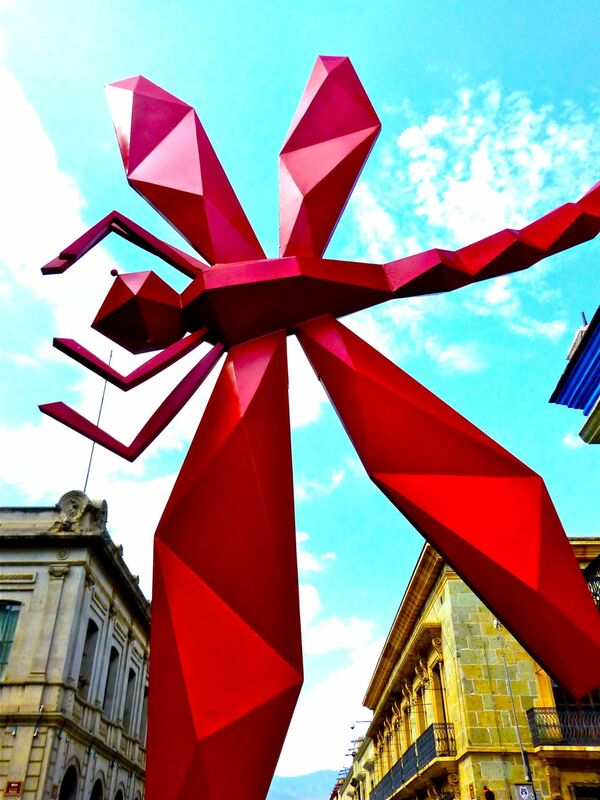 I wonder… What is artist Nicko Foster saying along the walls of calle Constitución? Another magical Domingo de Ramos spent in San Antonino Castillo Velasco. 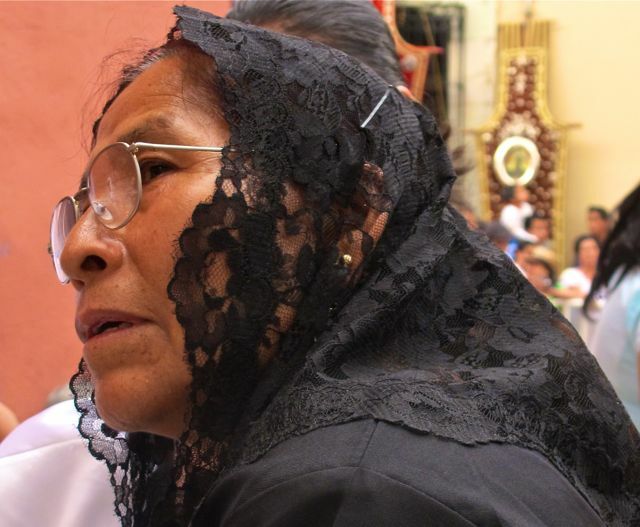 Experiencing Palm Sunday in this small Zapotec village never fails to nourish the soul. A band played outside the panteón as villagers, from niños and niñas to abuelas and abuelos, arrived bringing their biggest and most beautiful fruits and vegetables, breads and baked goods, carved wooden toys and embroidered clothing, not to mention, goats, chickens, rabbits, and even a pig or two. Three silver-haired abuelas inspected each donation; their faces expressing gratitude and appreciation for each offering, as they affixed a price tag. Following the procession to the templo and a mass, all would be sold to raise money for the work of the church. These were offerings to San Salvador, who sat proudly atop el Señor del Burrito, who was up to his ears in produce and bread. 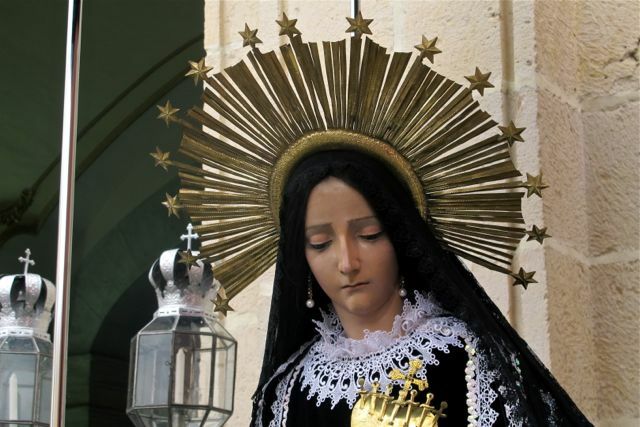 At 11:00 AM, after prayers were offered in gratitude and for continued abundance in this fertile valley, led by the beat of two tambors and the high-pitched lilt of a chirimía, a procession to the church began. 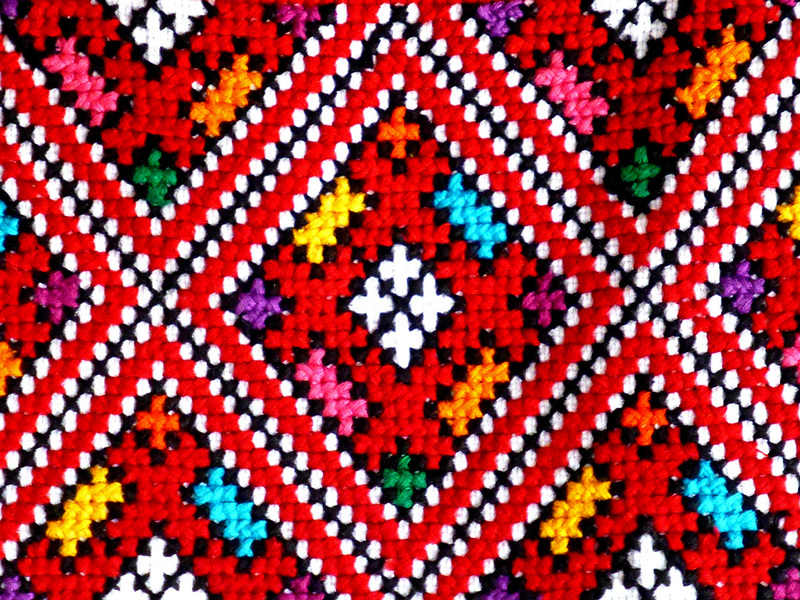 Palm crosses were distributed to villagers and visitors, alike, and many carried (or led, in the case of the livestock) the offerings that had been collected. 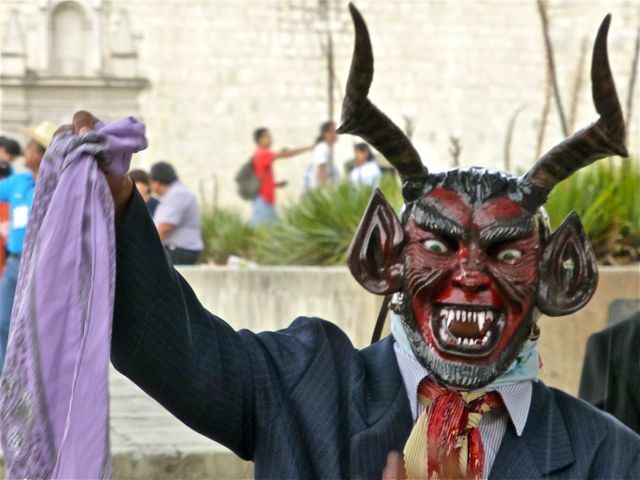 Once secured, it took twenty men to hoist and carry the bounty-laden anda, with San Salvador and the burro, a ritual reenactment of the Biblical story of Jesus entering Jerusalem riding on a burro to celebrate the Passover. 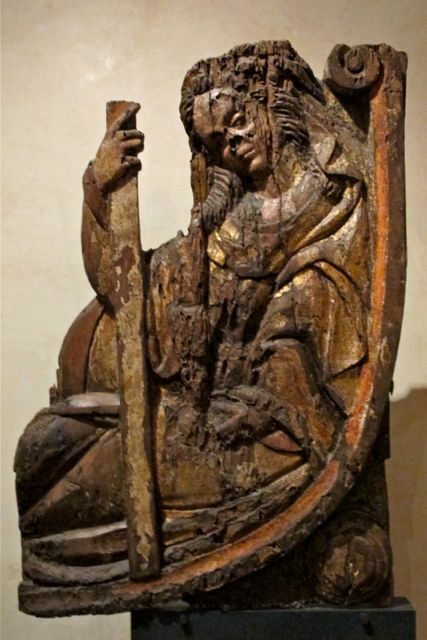 As the procession made its way to the church, the rhythmic sounds were occasionally overpowered by shouts warning the men of topes (speed bumps) and low hanging telephone wires that must be navigated, and then there were the stairs leading up to the church atrium. 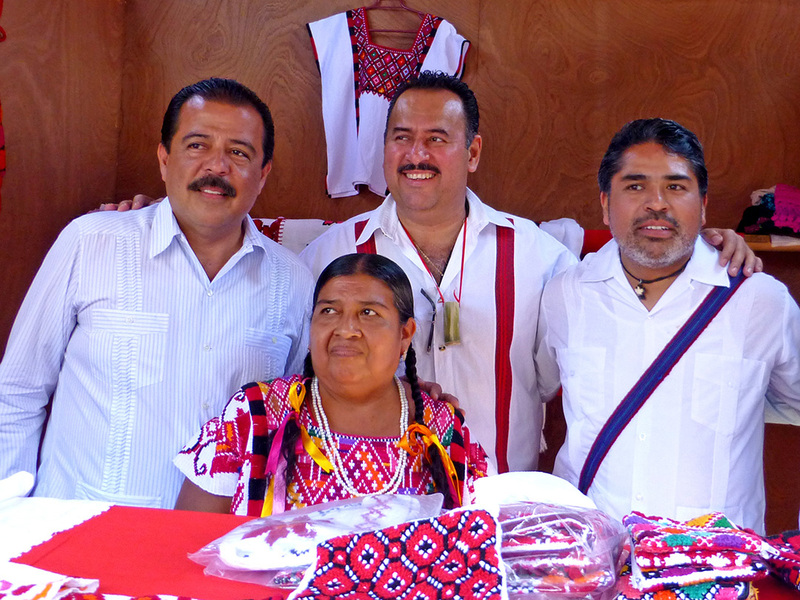 I cannot begin to express how warm and welcoming the people of San Antonino Castillo Velasco were. Countless times, as I was taking photos, officials encouraged me to come closer and villagers ushered me to the front. How many magical experiences can one person have? 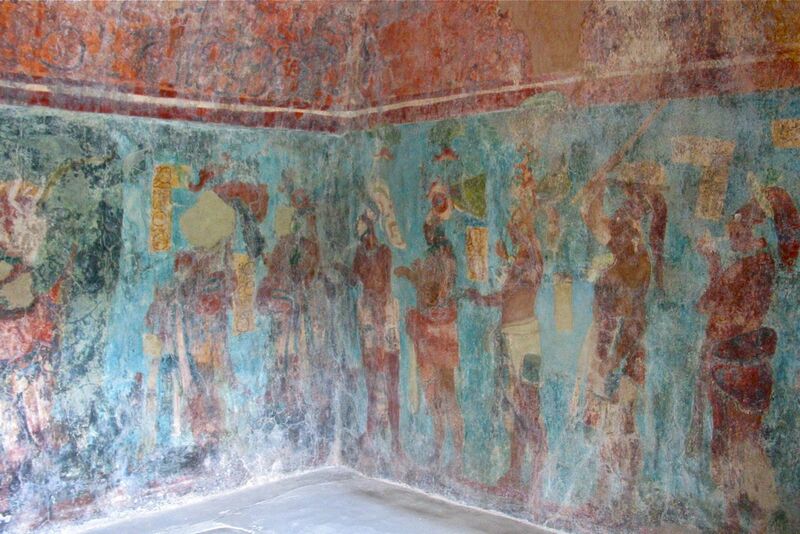 Maya fresco circa 790 C.E. 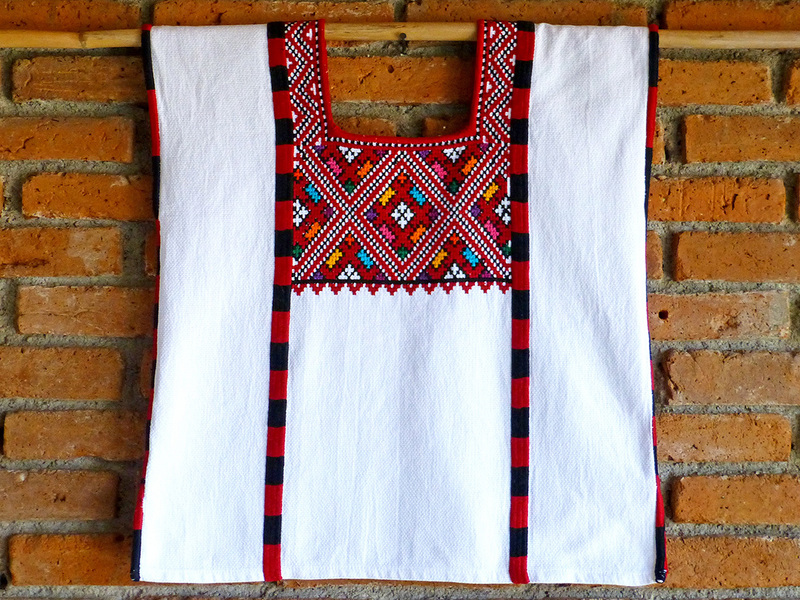 – Bonampak, Chiapas. 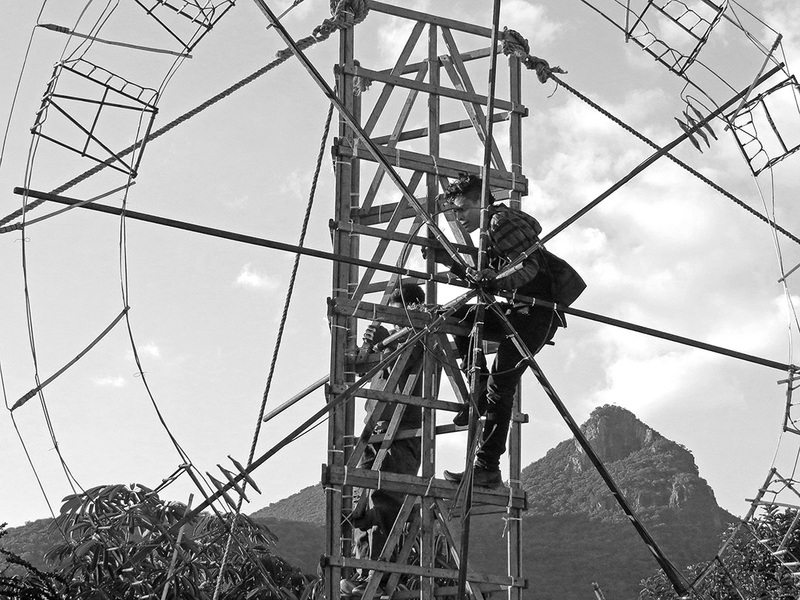 through the world-renowned and influential Mexican muralists of the twentieth century: Orozco, Rivera, Siqueiros, and others. 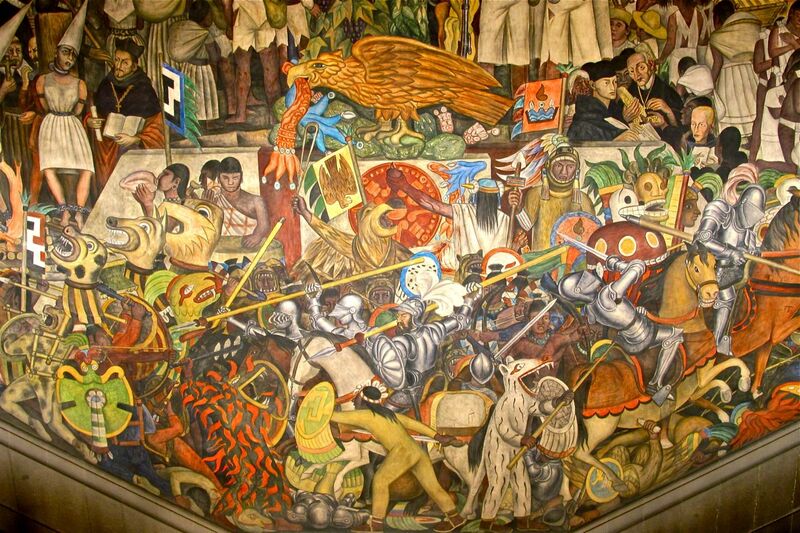 History of Mexico by Diego Rivera, 1931 – National Palace, Mexico City. 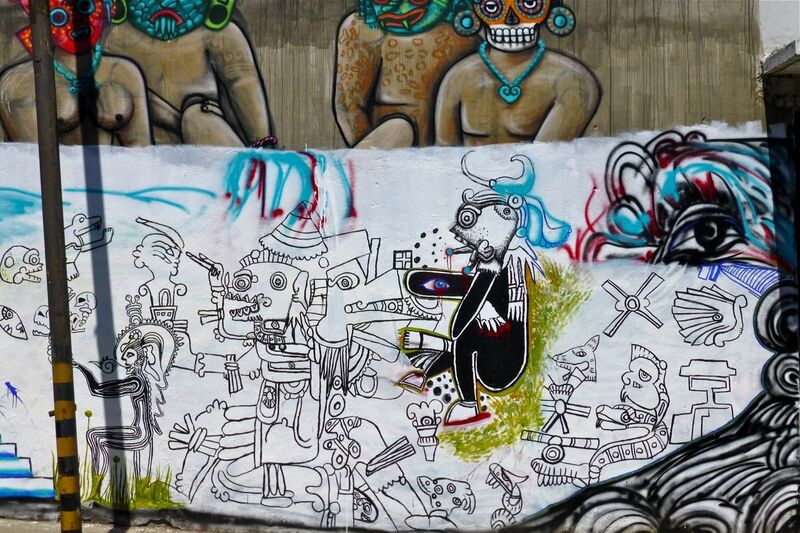 One of several murals in the pedestrian tunnel to the Guelaguetza auditorium in Oaxaca city. San Antonino Castillo Velasco, Oaxaca. reveal past and present — and hopes and fears for the future. Calle Tinoco y Palacios, between Vasconcelos and Niños Héroes, Oaxaca city. Those found on the streets we expect to be ephemeral, but commissioned work, both inside and outside of buildings, we hope would have a longer and more permanent lifespan. Of course, the Rockefeller family’s destruction of Diego Rivera’s Rockefeller Center mural showed differently. And, more recently, my friend and artist, Mike Alewitz experienced the obliteration of his mural on the side of the Pathfinder Building, also in New York. Both were instances of political differences and, while distressing, perhaps not too surprising. Central Connecticut State University (CCSU) has built up one of the largest mural collections in the country since the program started in 2001. But Professor Mike Alewitz, who oversees CCSU’s mural painting program, said that collection is at risk. The school has painted over six of the murals without notice and plans to do the same with another 12, Alewitz said Richard Bachoo, director of operations, confirmed. He said he hopes an appeal to the university and community support will protect the remaining murals. He says in the 14 years the mural program has existed, the policy has never been implemented in this way. Alewitz said in a statement that this is “the largest destruction of public art in recent history.” While administrators have removed murals in the past, they normally consult with the art department first, he said. 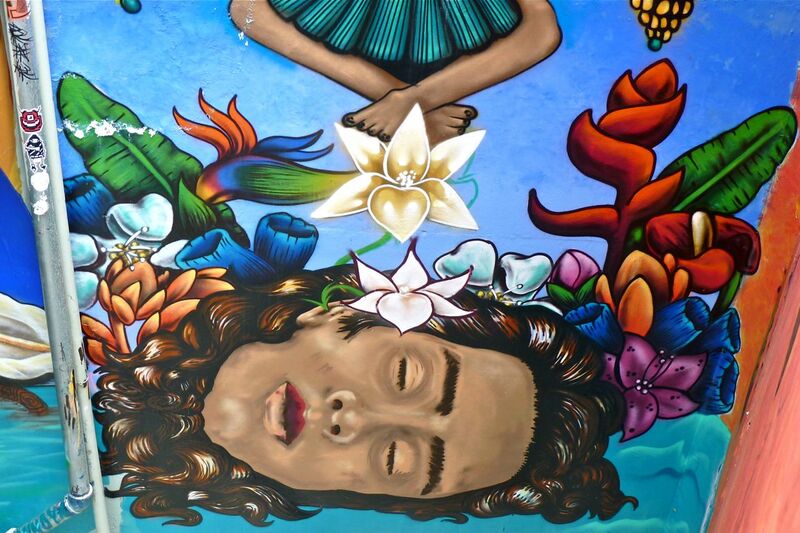 “The real policy has been that people love the murals, so when they’ve been painted, they’ve stayed up,” Alewitz said. 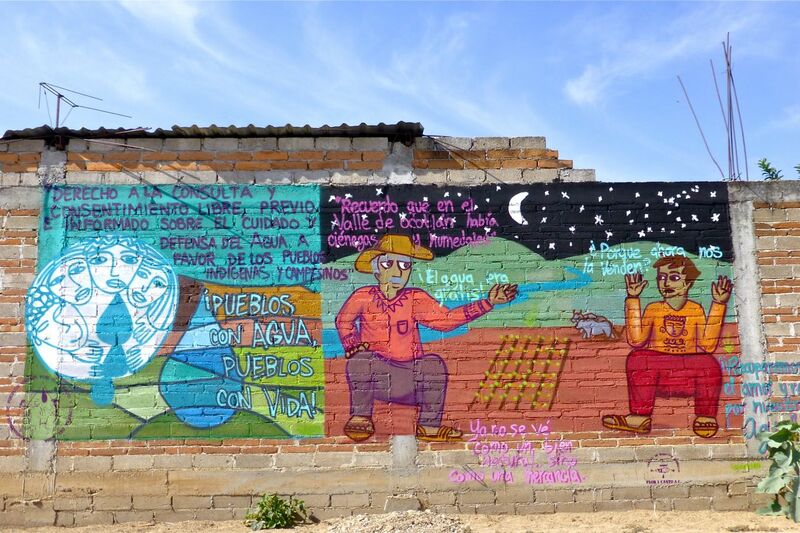 Oaxaca would lose much of her character and lessons would be lost, if we were to wake one morning and find all her murals disappeared. The story is the same at CCSU. For the full article, click HERE. To send messages of protest and to see some of the amazing student murals that enliven the walls and stimulate thinking at CCSU but are slated for destruction, click HERE. 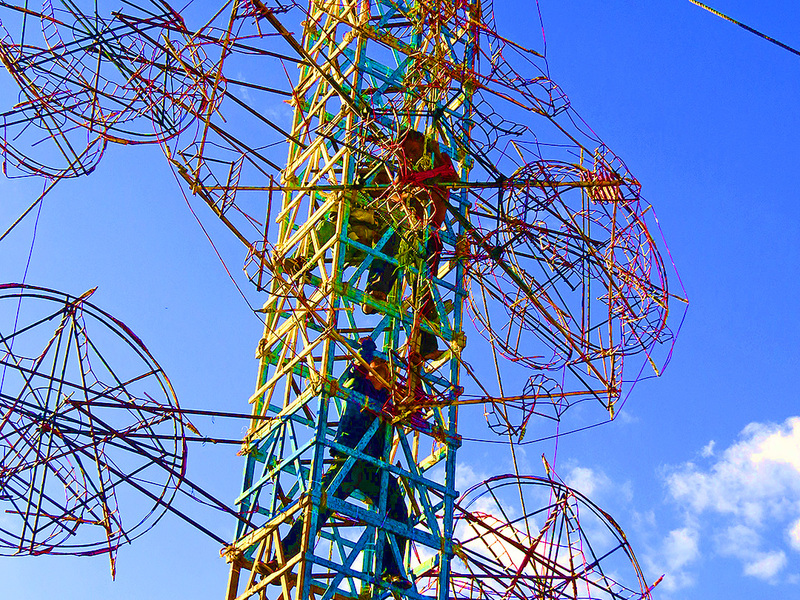 And, Why Bureaucrats Fear Art, is a letter to students and fellow artists, by Mike Alewitz. San Antonino Castillo Velasco continues to enchant. What’s not to like about a village known for growing flowers, decorating graves with designs created with flor inmortal (immortal flowers) during Día de los Muertos, and floral designs executed in exquisite embroidery?!! 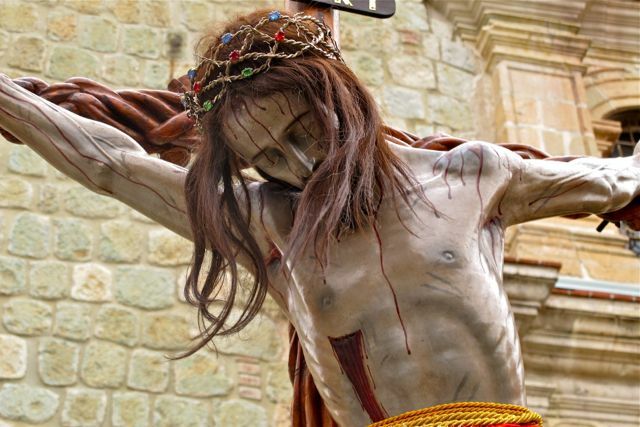 Then there is Palm Sunday and the tradition of gathering at the panteón, loading El Señor del Burrito with locally grown bounty, blessing by the priest, an incense led procession carrying it to the church, and then selling it to raise money for a local orphanage. Then there are the people… young and old, they are always gracious and welcoming. And this year, under temperatures threatening 90ºF, women were circulating throughout the gathering crowd, offering thirst quenching aguas to stave off dehydration. Oh yes, there were also kids and animals — and sometimes together! As I think I’ve mentioned before, children in these indigenous communities seem to always be included and when old enough (5 and up, I’m guessing), given responsibilities — joy and exuberance, along with patience and commitment, abound. I loved watching the little boys wrangling the goats as the procession proceeded from the panteón to the church. 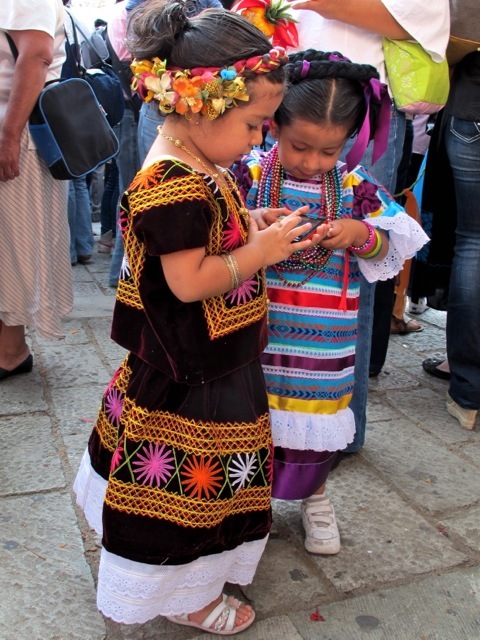 Today is Día de los Niños (Children’s Day) and it’s a big deal here. 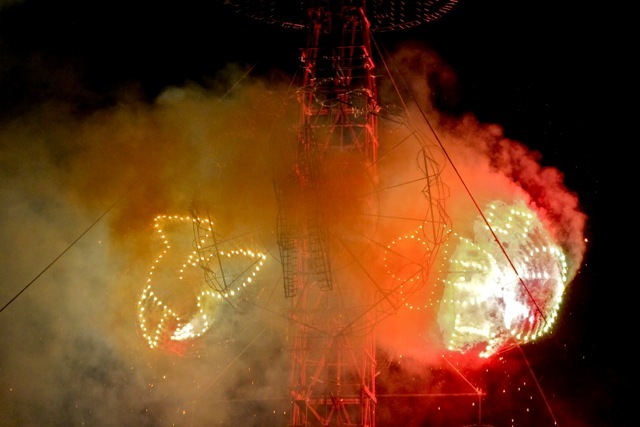 Oaxaca began her celebrations days ago. 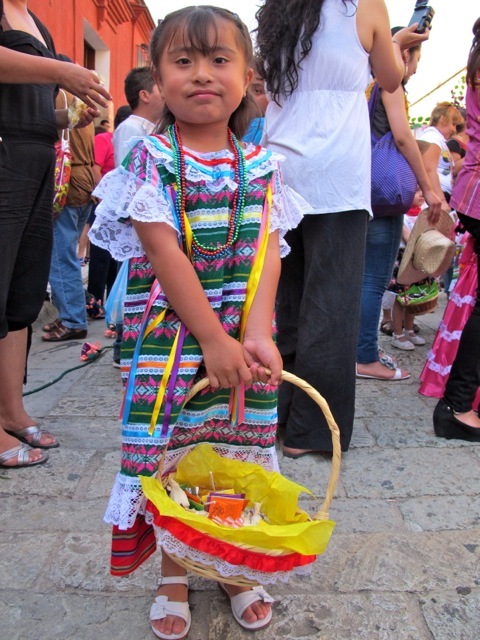 The 6th Festival of Children’s Story Telling opened on Saturday, yesterday an exibition of traditional toys (Colección Hanni Sager Juguete tradicional) had its inauguration at the Museo del Palacio, and Friday, the Guelaguetza Infantil calenda filled the streets from Santo Domingo to the Basilica de la Soledad. Today, in my mind, I was working on a different blog post. And then, walking home from my Spanish lesson, I came across these guys — and whips were cracking! Hmmm… they weren’t there an hour (plus) before. As I’ve said before, you just never know what you may find when you round a corner. Darn, before I had a chance to ask what was going on, the sky opened and everyone ran for cover — including me! 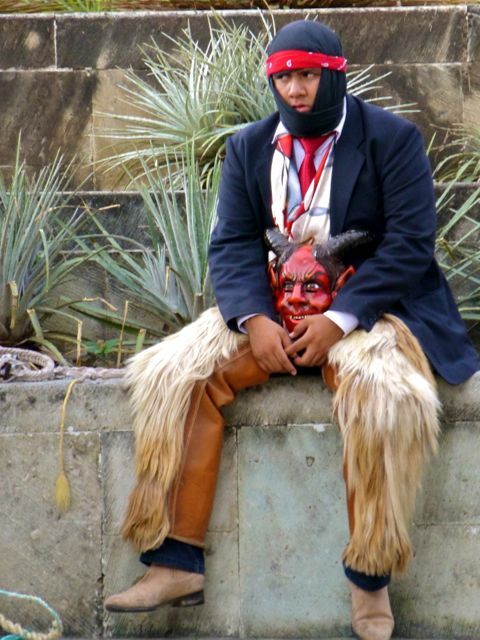 However, I’m thinking somewhere in the city, a Danza de los Diablos is happening! Friday was a delightful day… a late morning and early afternoon spent in leisurely conversation with one of my closest friends over desayuno at Cocina Economica Isabel, a stop at the Merced mercado to pick up some pan dulce, and a stroll through the Zócalo, before returning home. I envisioned a late afternoon and evening of visiting with my neighbor before she is heads north for a USA visit, catching up on email, and watching a movie. Perfection, I thought! Who could ask for more? 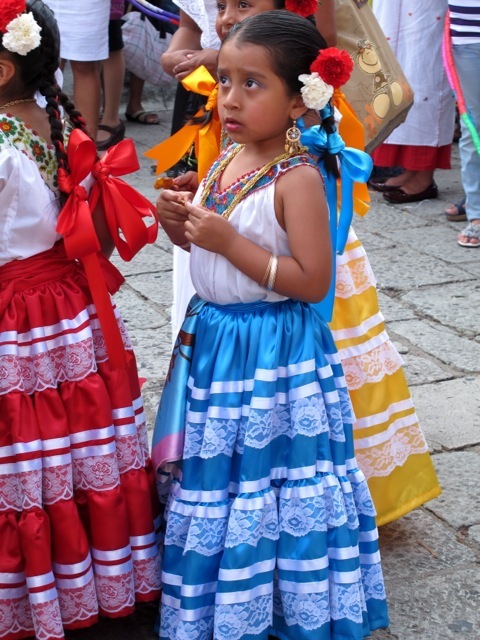 “More” came via my email inbox; notice of the 10th Guelaguetza Infantil, with a calenda (parade) from Santo Domingo de Guzmán to the Zócalo beginning at 6 PM. This definitely called for a change of plans! 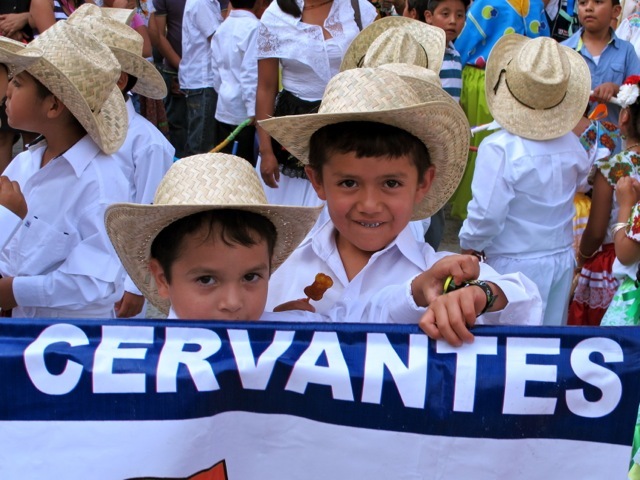 And, sure enough, as I got closer to Santo Domingo, there they were; delegations of children representing the regions of Oaxaca. 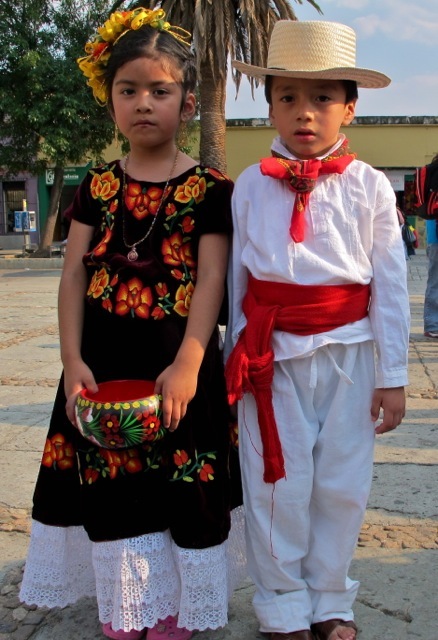 Istmo de Tehuantepec couple (a young Frida Kahlo, perhaps?) posing for photos. There were several bands playing and it got a little too loud for this girl from the Istmo. 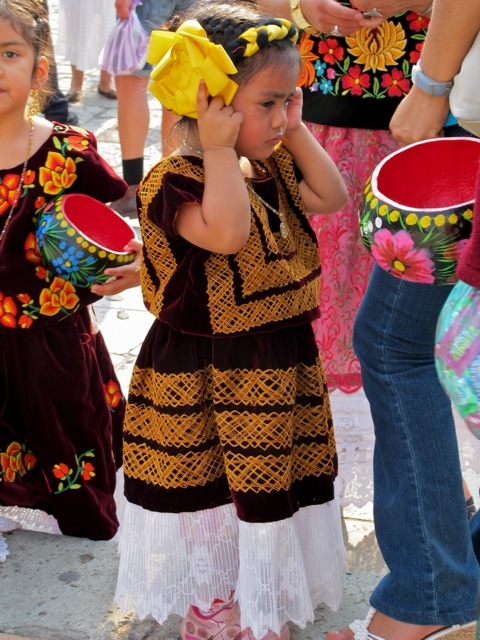 However this girl, representing the Papaloapan, didn’t seem to mind and was ready to toss candy to the crowd. She wasn’t alone — once the calenda started, candy began flying fast and furious and the pockets of the kids watching on the sidelines began bulging! Girls from the Costa region received last-minute instructions. Costa boys were charged with holding up their school banner. The girls representing the Papaloapan clutched plastic pineapples, ready for the always popular Flor de Piña dance from Tuxtepec. A little cross cultural comparing of notes (actually, cell phone games) was happening between the Istmo and Papaloapan. 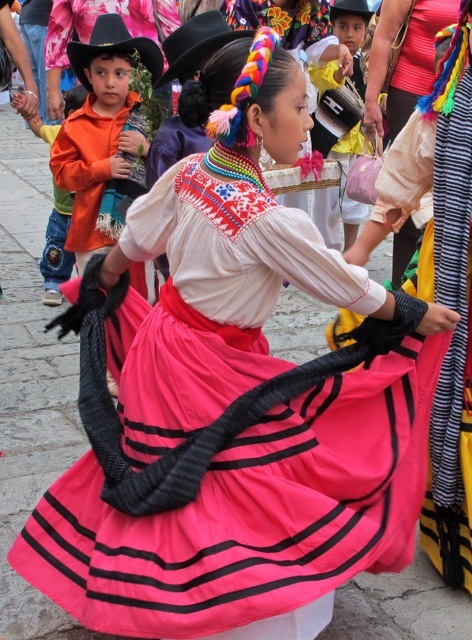 All the while, the dancers from the Mixteca danced their way down the Álcala. 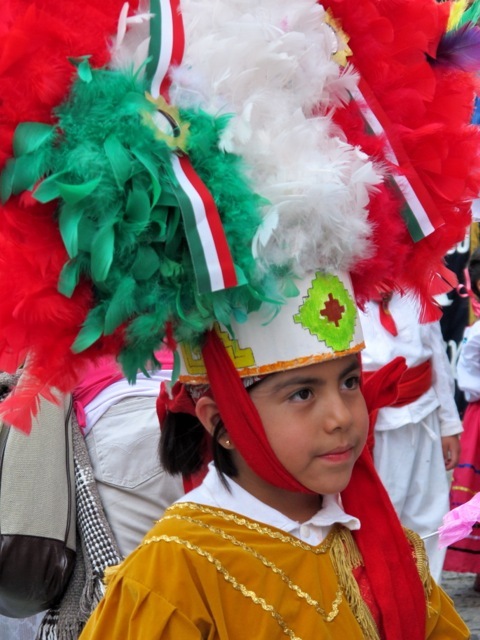 And, the young Danza de la Pluma danzantes, representing the Valles Centrales, carefully balanced their penachos (headdresses). 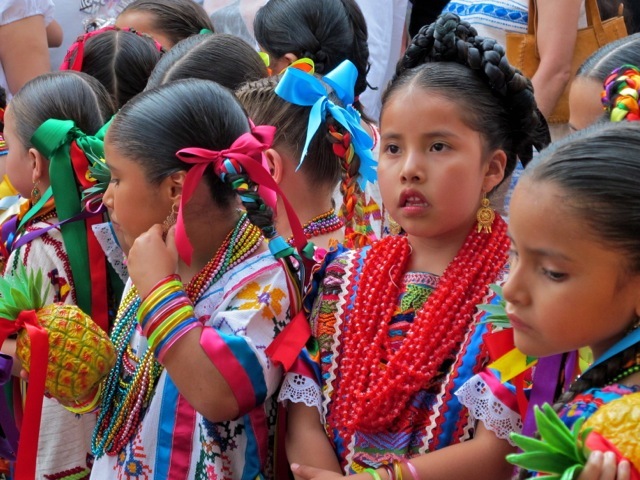 Tonight at 5 pm, these 300 kids from 52 preschools, will perform traditional regional dances in the auditorium of the Universidad Regional del Sureste, Rosario campus in San Sebastián Tutla.